Bring the symbol of luck and prosperity into your home with this little 1 inch Acorn Tile. Fire Creek has several glazes to choose from to compliment any décor. We hand craft every tile just for you so please allow 4-6 weeks delivery. Our tiles are made from stoneware clay for beauty and durability. You can have unique tile that reflects your personality. Choose Fire Creek tiles today! The Acorn has always been considered an emblem of good luck, prosperity, power and spiritual growth. Did you know that the English often carried acorns in their pockets during the Norman Conquest to protect them in battle. 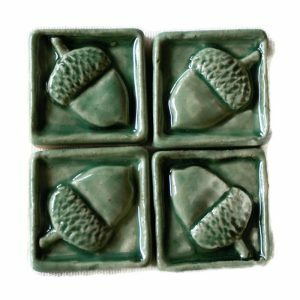 Whatever the Acorn symbolizes for you, these sweet, little Acorn 1 Inch Tiles are a perfect addition to your tile installation. Add a few of these by themselves or pair them with the Oak Leaves 2 in x 6 in Liner tile and the 12 in Oak Tree tile to complete a Backsplash Mural. Each tile begins as slab of clay, hand carved and cast in plaster. Take a moment to read about our tile process HERE We have several glazes for you to choose from in our shop. A variety of colors to match any tile installation and décor. Fire Creek can help you achieve the look of your dreams. We craft every tile just for you, so please allow 4-6 weeks delivery. Do you still have questions? You can find answers to all of our frequently asked questions HERE. You don’t have to have the same box store tiles that everyone else has. Be bold, Be brave, Be you! Choose tile that reflects your personality and has meaning to you. Get Fire Creek tiles today!